To the person who said it was boomy and didn't blend well...............you have to match your whole system,and some (even audiophile speakers) wont sound good unless the whole system matches.It was a bad uninformed review of this speaker.I match mine to Forte IIs up front and KG4s in back.....I dare you to find a flaw. Marantz sr7500 amp, mission 737r. Blends well with smaller speakers. Good imaging and frequency response. None really... Except maybe the finish. I bought this at the local Good Will. I was mostly surprised to see a name brand speaker there... Anyhow, I bought this unit to replace a Wharfedale Emmerald Centre speaker that moved out to my new recording studio I am still building. The speaker was pretty well beat up, but it would be going behind a cloth curtain, so looks did not matter. It is a big and heavy unit, but it weighed about the same as the smaller Wharfedale it replaced. I use PA speakers on a routine basis, running sound for different events and local bands, so I know the benefits of having a horn loaded HF driver. Those benefits carry through to home audio too it would seem. The Klipsch seems to blend well with the speakers I am currently using as mains (Wharfedale Diamond 7.2 Anneversary edition), and the shielding on the magnets is good enough not to distort/discolor my very sensitive 36" Zenith/Intq HDTV. Overall, a good replacement for the Wharfedale. Wharfedale Emmerald Centre. Wharfedale Sapphire Centre. the finish is not so good but its ok. This center really makes you enjoy movies, after listen to lots of brands in different hifi audio stores, I finally came to the RC3. The sounds of the guns in "road to perdition" sounded like if they wher fired inside my house. this center channel rocks, there is only realy a few things that i can say, but they will sum it all up. basicall this speaker makes your whole movie watching experiance amazingly better, the highs are so crisp, and clean, and the base response is great, although thats not really what a center channel is know to do. Clarity and good bass. Gets loud. Would be better with a full Klipsch system. Speaker is a bit to efficient when mixed with other brands and is hard to match up the loudness. After trying several other brands, I settled on Klipsch again. I had an old Klipsh rebel as my center speaker (still have the rebels for my surronds). I added my older Dahlquist speakers on an Adcom Amp for my fronts but wanted more sound from my center. My problem was trying to match up the center with my Dahlquists. Nothing matches up very well but the Klipsch at least doesn't have the boxy sound the Infinity Alpha had and it had a warmer, richer sound than the Boston did. Overall it sounds great with good bass and clear vocals. Super clean, super clear. Full range speaker. Sturdy construction. Bi-wire capability for increased clarity. Cosmetically appealing. Should be the ruler by which center channels are judged. This center channel rocks! Super clean, clear and has great range of highs to lows. Did I mention clean and clear?! Very sturdy construction. Has been A/B against a JBL and an Energy center channel. Higher output than either due to better sensativity rating. Just overall sounded better. Wanna know how good? Put in the 1st Crow DVD. On the DTS audio mode watch the big throwdown scene where Brandon Lee takes on 2 doz. heavily armed gangstas. The audio track seems to be heavily localized in the center channel. This speaker dropped my jaw. It handles glass breaking to the pumping of Brandon Lee's revolver in spectacular fashion. I now use that scene to show off the power of my center channel to all my audiophile friends. Definately worth the investment!! Awesome Center Channel. I recently replaced my JBL Home Theater with Klipsch RC3II,RS3II and RF3II with a Pioneer Elite VSX-41 & Hitachi 57" HDTV. The entire package is unbelievable. The Ref. series speakers look as good as they sound too. This Center Rocks! I was sceptical about buying online but acousticsounddesign.com came highly recommended from the A/V forums I visit. Mike (the owner) was very helpful. Blends well with my other speakers. Lots of range, and lots of sound. Big. Dunno if a center this large is necessary for small rooms if you have good imaging from your front speakers. RC-3 tends to overpower smaller bookshelf speakers if you can't space them adequately. This review is for the RC3-II. Sounds great. A bit sharp at first, but after several hours of breaking in, it blended well with my RB-5's. I must admit though, for a small room, it's big and very dominant. My RB-5's are about 10 feet apart, and they image well enough at that distance that the center channel didn't make as big a difference as I thought, and if anything, it clouds some of the stereo info. I could have probably gone with with a smaller KC center and gotten good enough center sound. Klipsch should make an RC-1 or something with smaller reference speakers, because the RC-3 seems to be overkill for small rooms when used with RB-3 and RB-5 main speakers. Listened to lots in demo rooms. A little big, and heavier than I expected, but maybe that's why it sounds so good. 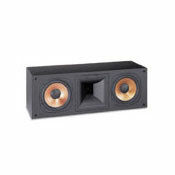 The Klipsch RC3 II Center Channel was the best I could find anywhere near the price. It's great for music as well as for movies. Clear, crisp. Combined with Klipsch RF3 or RF5 main speakers which I demoed, it blends in perfectly and isn't overpowering when listening to music. Used with a Yamaha RX-1300.